Would you read an article written by Sandy Alderson describing exactly what went down at the 2015 trade deadline? Crying Wilmer Flores, rejecting Carlos Gomez, and acquiring La Potencia? Imagine the retweets. Something like that actually happened in 1967, when the Los Angeles Dodgers’ general manager, Buzzie Bavasi, penned a four-part series in Sports Illustrated. The best of those pieces provided a behind-the-scenes look at the 1966 spring training double-holdout of Don Drysdale and Sandy Koufax. This was no Operation Shutdown. In 1966, Curt Flood was three years from challenging baseball’s infamous reserve clause. Free agency as we know it was a decade away, so established veterans like Koufax and Drysdale possessed little leverage. It mattered not at all that Koufax had led the league in ERA–averaging 2.02!–for the preceding four years, nor that Drysdale had led the league in games started–averaging 41!–in four consecutive seasons. They could choose to sign the contract the Dodgers stuck in front of them, or they could stay home. That year, Koufax and Drysdale threatened to stay home. From today’s perspective, Bavasi’s article is incredible: “[N]obody on the ball club, including me and [field manager] Walter Alston, was ever going to get more than a one-year contract.” Bavasi had budgeted a mere $15,000 raise for Koufax and $10,000 raise for Drysdale. That’s what he expected the pitchers to accept. But when half the Dodgers’ starting rotation–the future Hall of Famer half–combined forces to negotiate, they ended up with “the biggest raises in baseball history.” You might call the two players’ combined force a union. Fifty years after the great double holdout of 1966, the Major League Baseball Players’ Association is widely recognized as the most powerful union in sports. The top stars in baseball receive more than their counterparts in basketball, football or hockey. Long-term contracts are guaranteed. The MLBPA believes it has so accomplished its goals that it now focuses its collective-bargaining efforts on ensuring that spring training buses allocate two seats for each player and that every clubhouse has its own chef. Yet, a vestige of the reserve clause remains. Clubs can unilaterally renew the contracts of players with fewer than three years of service time. The poster boy for this unfairness is Mike Trout, who in 2012 produced 8.5 WARP and finished second in MVP voting. The Angels renewed his 2013 contract for essentially the league minimum. Trout’s agent spoke out about the unfairness, but Trout signed the deal anyway. Teams have begun to recognize there’s a problem when young MVPs are making a fraction of older players’ salaries. The Cubs will compensate Kris Bryant in 2017 with hundreds of thousands more than they’re required to pay. The Red Sox will do the same with Mookie Betts. Still, the $950,000 Betts will earn this season is so far beneath his $25-million-plus true value that Betts symbolically refused to sign the contract Boston tendered. It doesn’t matter; the Red Sox retain his services anyway. Two young Mets have also protest their automatically renewed below-market contracts. After Jacob deGrom went 14-8 with a 2.54 ERA and led the Mets to the 2015 World Series, the team renewed his contract at a minimal $607,000. But deGrom did not sign. And following Noah Syndergaard’s 14-9, 2.60 ERA 2016 season, the Mets renewed his contract at $605,550. Thor spit on that contract. These Mets–and Yonenis Cespedes–share the same agent, Brodie Van Wagenen of the Creative Artists Agency. When deGrom protested, Van Wagenen was quick to say that the unilateral contract renewal won’t affect the player’s relationship with the team. Maybe that’s true, but it misses the point. The real question is whether these young studs–Bryant, Betts, Syndergaard, deGrom, Carlos Correa, who just criticized his own minimum-salary renewal–will bring their growing presence to bear inside the MLBPA. Today’s under-compensated pre-arb players are tomorrow’s multimillionaire veterans. 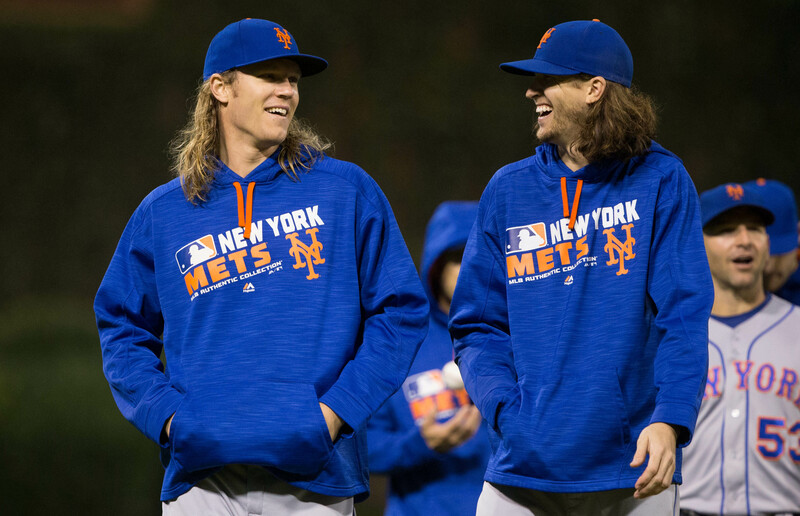 When they’re established stars, will Syndergaard and deGrom demand leadership roles in the union and advocate for change to a collectively-bargained agreement that depressed their salaries when they were younger? Will they remember the indignity of being forced to play for a team-set salary and ensure that the next generation gets a much bigger piece of the salary pie? In 1966, Koufax and Drysdale rebelled against an MLB whose antitrust exemption allowed teams to not compete for players under other teams’ control. No matter how much money the Yankees could spend, they never considered offering Koufax double his salary to move from L.A. to the Bronx. Koufax and Drysdale showed guts in holding out, though the risk was solely for their own personal gain. When the current CBA expires in 2021, it would be even more courageous for Syndergaard and deGrom to speak against their best interest as veteran players, to insist they receive less money themselves in order to dismantle a system they know is unfair. Maybe they’ll co-author a piece in the Players’ Tribune, under the auspices of the New York Bureau Chief? I can’t wait to read that article. I don’t think the Dodgers were in Brooklyn in 1967. The Dodgers were definitely in L.A. when they beat the Mets in the 1988 NLCS. Before then? Cloudy. Thanks, and fixed.